NowSMS supports sending OTA (Over-the-Air) configuration information to mobile devices in order to configure some phone settings, such as internet browser, MMS, SyncML, and instant messaging settings. 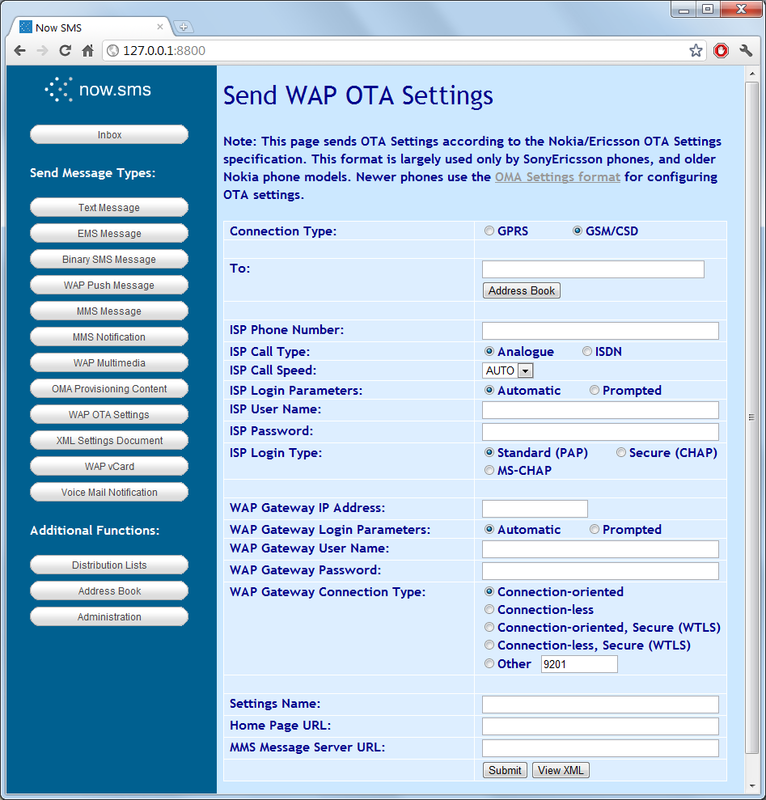 The “Send WAP OTA Settings” option sends configuration settings in a format that is compatible with the Nokia/Ericsson OTA Specification (up to and including v7.1). This specification is mostly used by older devices, while most newer devices use the OMA (Open Mobile Alliance) OTA Provisioning Content, which is accessible via the Send OMA OTA Settings menu. 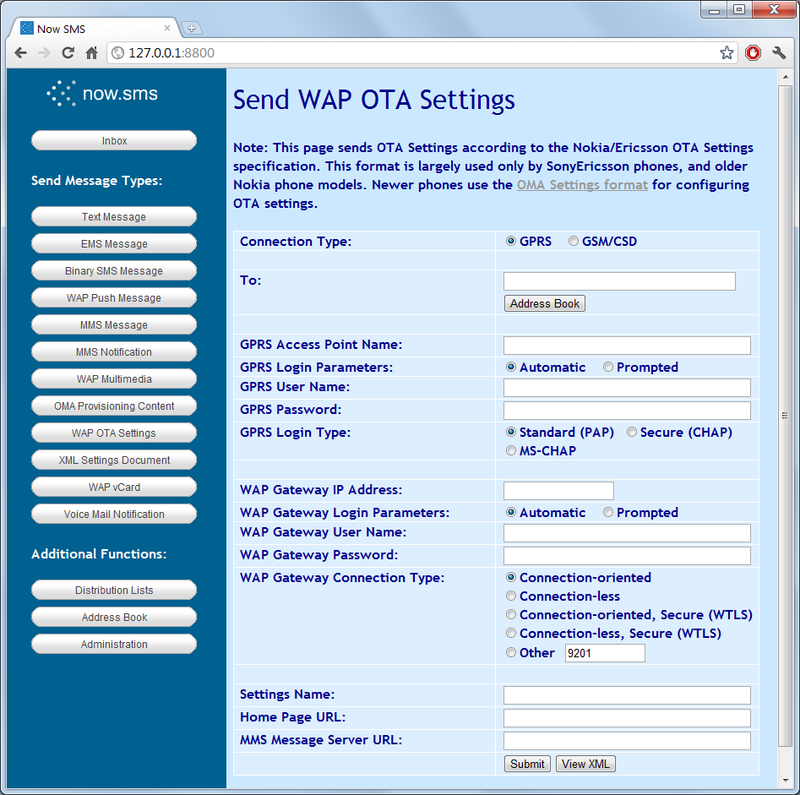 There are four different types of WAP OTA settings. Connection (and MMS Settings) – This sends configuration settings for the WAP/internet browser and/or MMS client. Wireless Village/IMPS Settings – This sends configuration settings for the Instant Messaging client. 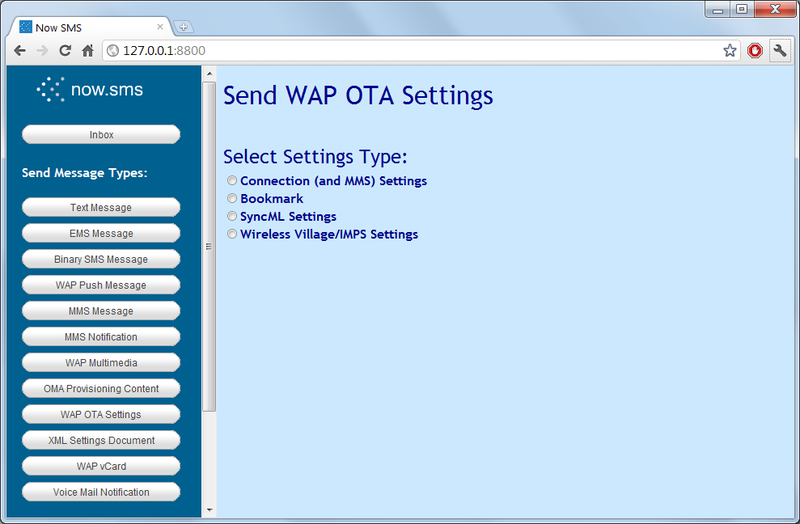 Additional information regarding WAP OTA settings can be found in Sending WAP OTA Settings. Note that beginning with NowSMS 2007, there is now a “View XML” button on all of the WAP and OMA OTA Settings forms. This button will display the XML document that NowSMS has generated for the current web form. This allows for easier customisation of settings to meet different requirements. 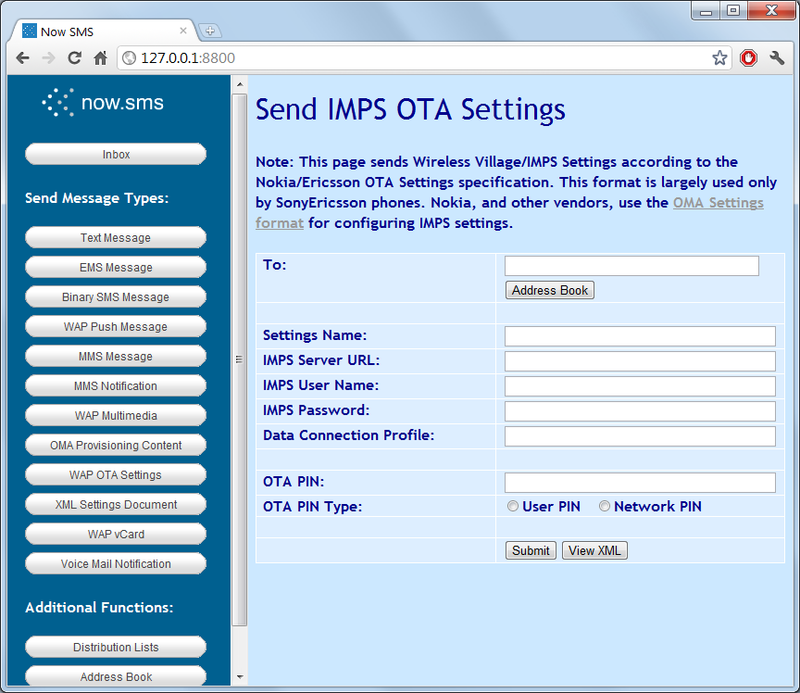 The OTA web forms supported by NowSMS are displayed on the following pages. “Connection Type” specifies whether to use GPRS/EDGE/Packet Data, or GSM/CSD (Circuit-Switched Data). The web form is different depending on this selection, here we will describe the settings relevant for GPRS/EDGE/Packet Data. “Phone Number to Receive Settings” is a comma delimited list of one or more phone numbers to receive the settings via SMS. “GPRS Access Point Name” is the Access Point Name (APN) that should be used for these connection settings. “GPRS Login Type” specifies the authentication protocol to be used for sending the user name and password for connecting to the access point. The standard choice is “PAP”, however “CHAP” and “MS-CHAP” can also be selected. “WAP Gateway IP Address” specifies the IP address of a WAP gateway to be used for this connection profile. “WAP Gateway Connection Type” specifies which of the WAP protocols to use when connecting to the WAP Gateway. For most mobile operator gateways, you would use “Connection-oriented” for a standard non-secure connection (port 9201), or “Connection-oriented, Secure (WTLS)” for a secure connection (port 9203). The “Connection-less” protocols provide limited functionality. For a WAP2/HTTP Proxy, the port number is installation dependent. Frequently port 8080 is used, but it can be any port value. “Settings Name” provides a descriptive name for the connection settings, which may be displayed on the mobile phone. “Home Page URL” specifies the home page to be configured for the settings, if these settings are to be used to configure WAP/internet browser settings. “MMS Message Server URL” specifies the URL for the MMSC server, if these settings are to be used to configure the MMS client. Note that some phones support both the “Home Page URL” and “MMS Message Server URL” elements being present, and will configure both the WAP/internet browser and the MMS client. Other phones will only support one of these settings being present. Use the “Submit” button to send the settings, or use the “View XML” button to view the XML settings that are generated by this web form. Note: To define connection settings that do not use a proxy, leave the “WAP Gateway IP Address” field blank, and set the “WAP Gateway Connection Type” to port “80”. “Connection Type” specifies whether to use GPRS/EDGE/Packet Data, or GSM/CSD (Circuit-Switched Data). The web form is different depending on this selection, here we will describe the settings relevant for GSM/CSD. “ISP Phone Number” is the phone number to be dialed to connect to the access server. “ISP Call Type” specifies whether the connection type is “Analogue” or “ISDN”. “ISP Call Speed” specifies the speed of the connection. Normally this would be set to “AUTO”, but it may be necessary to configure a specific speed in special situations. If “ISP Login Parameters” is set to “Prompted”, then the browser will prompt for a user name and password every time a connection is attempt, and the “ISP User Name” and “ISP Password” settings will be ignored. If it is set to “Automatic”, the user will not be prompted for login information, and the “ISP User Name” and “ISP Password” fields will be used automatically. “ISP Login Type” specifies the authentication protocol to be used for sending the user name and password for connecting to the access server. The standard choice is “PAP”, however “CHAP” and “MS-CHAP” can also be selected. “Phone Number” specifies a comma delimited list of one or more phone numbers to receive the bookmark. “Text” specifies the descriptive name for the bookmark. “WAP URL” specifies the HTTP URL for the bookmark. Please note that this functionality is not very widely supported, and is mostly supported only by older Nokia phones. “Settings Name” is a descriptive name for the settings that may be displayed on the mobile phone. “Sync URL” is the HTTP URL associated with the SyncML server. “Sync Port” is the port number associated with the SyncML server. Normally this would be part of the “Sync URL”, but there is some ambiguity in this OTA specification. User authentication in SyncML can be done on different levels. Therefore this OTA form contains many forms that allow a user name and password to be input. Normally, user authentication will only be performed by the SyncML Server, in which case it is only necessary to use the “Sync Server User Name”, “Sync Server Password” and “Sync Server Auth Scheme” settings for specifying a user name and password. If HTTP Authentication is needed (Authorization: header), then the “Sync HTTP User Name”, “Sync HTTP Password” and “Sync HTTP Auth Scheme” settings can be used. The “Data Connection Profile” setting refers to an existing data connection profile that should exist on the device (e.g., the “Settings Name” associated with OTA settings for a browser connection settings message that was previously sent to the device). The “Data Connection Type” specifies whether the “Data Connection Profile” uses a “WAP Proxy” or an “HTTP Proxy” (although it is unclear why this might be necessary to know in the SyncML settings). “OTA PIN” and “OTA PIN Type” are optional parameters supported for SyncML settings over WAP OTA, but that are commonly used in OMA OTA requests. An “OTA PIN” can be associated with an OTA settings message to provide a layer of authentication to the message. Many devices will allow you to send OTA settings without a PIN, but some will require a PIN to be present before the settings will be accepted. “IMPS Server URL” is the HTTP URL associated with the Wireless Village/IMPS server. “IMPS User Name” and “IMPS Password” define the user name and password for logging into the Wireless Village/IMPS Server. The “Data Connection Profile” setting refers to an existing data connection profile that should exist on the device (e.g., the “Settings Name” associated with OTA settings for a browser connection settings message that was previously sent to the device). “OTA PIN” and “OTA PIN Type” are optional parameters supported for IMPS settings over WAP OTA, but that are commonly used in OMA OTA requests.